My wife’s father was a great believer in using “good old manure” for his backyard tomatoes and his beautiful, prize winning tubular begonias. He would travel the highways and by-ways of South Eastern Wisconsin, always with several small helpers in the back seat, in search of the “perfect” pile as well as a generous farmer. His concern for replenishing the soil was not lost on my wife, as she usually had to shovel, while her father, leaned on his shovel, chatted with the farmer. This tradition was carried forward to our family while dabbling in urban gardening. We moved to a five acre lot in The Town of Oconomowoc over 27 years ago with young children and a vision of having elbow room along with the kind of “pets” that you can only have in a rural setting. Over the years there were horses, pigs, a steer, rabbits again, chickens, cats, dogs, and an old goat named Fezziwig. 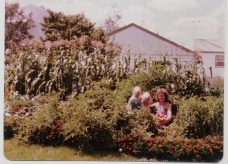 There was always a large vegetable garden. Then it happened. While visiting a daughter at college in Stevens Point and eating at her favorite restaurant, she said “Dad, you have to try the garlic.” Garlic? There was roasted Garlic on the menu as an appetizer. You received a very large Softneck bulb with the top cut off, exposing the cloves, it was oiled and baked to brown goodness. There was a small pick for digging the cloves out of the wrappers along with some crackers. Mild Garlicky flavored paste on crackers, YUM. 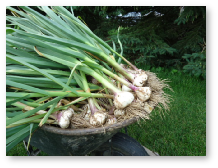 I had always thought of Garlic, like an onion, as this pungent, earthy spice that you always added to something. 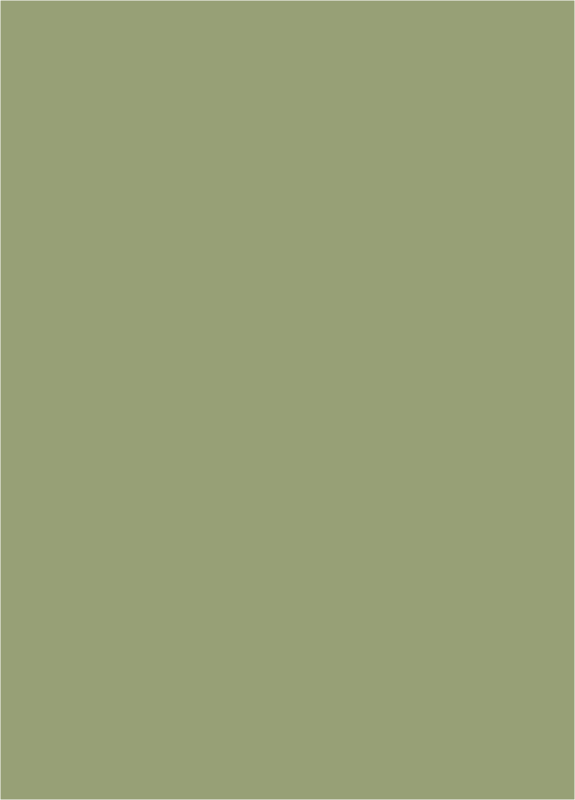 Now, it was something to enjoy on its own, not just treated as a spice. On the grill, wrapped in foil or squired with shrimp on the grill. Fried in a cast iron pan with butter, chopped raw and turned in to salsa or pesto. There is always a different exciting way to try eating Garlic. 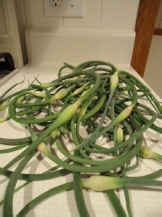 Do not forget about Garlic Scapes. You can try them sautéed into an omelet or on top of a burger, as a side with and steak and potatoes. Take a bunch of them to work to share, but be prepared to answer a lot of questions and expect to be asked for more after they are taken home and enjoyed. The children have moved out and the pets have been reduced to just dogs and a cat. 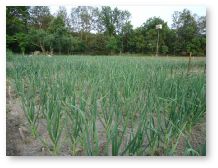 Now, the vegetable garden rotates within the Garlic planting area along with cover crops and we still raise a few pigs each year while the remainder of our land pastures the neighbor’s cattle. We have been blessed with rich, fertile topsoil. No herbicides or pesticides were used back when we were urban gardeners and these same Earth friendly, sustainable farming practices remain in place here today. 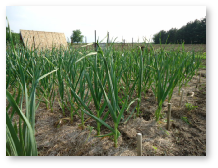 A hobby has grown into a passion for growing gourmet Garlic, and with that, we have decided to grow and market it. We are a small producer and will continue to add varieties and volume as sales permit.